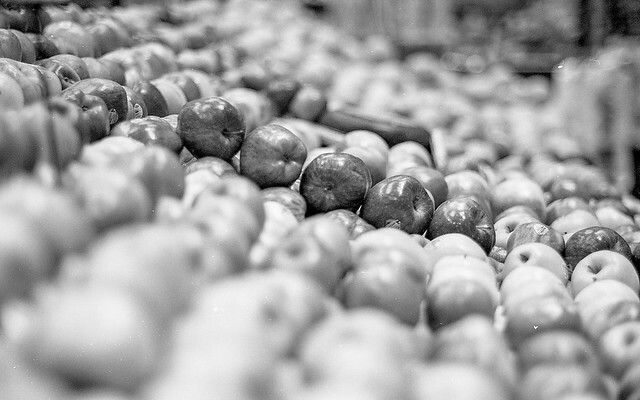 And I loved what the Leica M3 (KEH Blog Post here) could do. My hesitancy is because there is a lot I would like to share. What happened? As much as I loved the M3 functionally it was a dead end fiscally. Body: I would rather in body metering. But that means a film M6 (M5 also technically) which currently goes for more than a few brand new full-frame digital cameras. 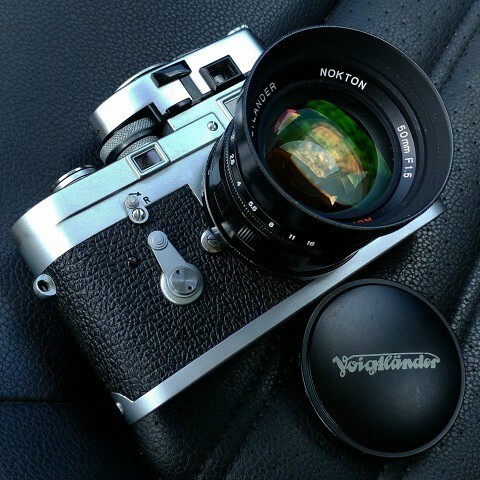 Lens: Had and loved the Voigtlander 50mm f/1.5. But why not a proper Leica? They are quite expensive, especially when you go brighter than f/2. Multiples of the cost of the M3 body alone used in fact. Media: An M mount digital Leica was beyond my reach. The cost of moving to a digital M mount was a hard proposition for me personally. Sidebar: Not saying digital M mounts are not worth the price. They are. Simply a matter of them costing more than I am willing or able to spend. What did I do next? I already enjoyed Voigtlander lenses so I went for a less expensive Voigtlander Bessa R2 that has in body metering with which to hang my M mount lenses off of. Perfect for my purposes for much less spend. So it looks like I dodged the Leica bullet. What happened? Put simply the Q happened. An AF Summilux lens included where a manual focus M version would cost more alone. No rangefinder, but zoom and peeking aids like those I grew to appreciate on other mirrorless cameras. Full frame. As much as I appreciate the Leica name I would not purchase a less than full frame Leica product. Personal preference. I stopped reading further. Knew I was in trouble. A close encounter with a Q in the wild proved problematic as well. On a local photo walk accomplished photographer Edde Burgess took what is still to this day my favorite portrait of myself. Had no idea he took this shot until it was posted to the meetup forum. Edde took this with his Leica Q that I tried not to look directly at for too long during the walk. In short, I had a medium format film camera in hand and a bag full of digital gear, while Edde was rolling with one self-contained wonder. Still, I resisted. A Q showed up at my local camera shop recently. Took it in hand and told myself not to look at the price on the bottom. I looked. Was initially stunned by, but not really surprised by, the price. Holding its value better than I had hoped. Went home and looked at the prices of examples online and realized the Q really holds its value. This local example was very much priced to move. If I ever was going to get one this would likely have to be it. Dang it. Went on to finally read and watch the reviews and deep dive into the specs I had all avoided all of these years. Hope was that these would back me down. Snap me out of it. Sheesh. A rare consensus. Praise after praise. And the specs listed features I did not expect of any all in one camera, especially a Leica. Found this particularly surprising. My one real bogey, the RX1, does not have this feature. Digital stabilization does not count. Having long become spoiled with OIS it is now a must-have feature. So avoided early reviews and specs that I had no idea that it had a macro function. The party piece is the shifting distance markings. Amazing bit of engineering and design that actually works. Silent shooting with physical shutter up to 1/2000s and flash sync up to 1/500s. Will not ever likely use flash, but the silent shooting is a definite plus. Up to 1/16,000s shutter. What? This means completely silent stills in daylight with the aperture wide open without an ND filter any time I want. Well implemented remote control and file transfers by all accounts. I see you Leica. 3 years old and bests the rightly highly regarded newbie 8 fps A7iii (No ding intended. Love that camera. Just facts.). Fast and accurate AF on a full frame Leica. That is a ‘take my money’ sentence. With assists. WIth hard stops. Focus tab with an ingenious AF/MF switch built in. Press it and the focus tab is released. Not drive by wire. With zoom and peeking. No, it is not a proper rangefinder, but it more than makes up for it with it’s well thought out and elegant implementation. Another ‘take my money’ feature. Touch screen with touch focus. Greatly helps to mitigate the omission of a tilt screen for me. Most recent firmware I installed added a favorites menu where you can choose what comes up first. Found the menus already to be intuitive and quick to navigate, but this is even better. Quickly switch between my favorite self defined configurations (B&W/High Speed/Street/Normal) just like I have set on all of my other cameras. Not pro grade. No mic jack. Not 4K. But AF tracking is good and more than serviceable for the few occasions I would want to capture video. Decided a test drive was in order. Does it add up? Have been disappointed in the past when real life experience does not match the hype and/or spec sheet. Not the case here. Lower price non Leica comparisons. Having owned and tried many all in one digital cameras (Sony RX1 line, Fuji X100 line, Ricoh GR line and the like) I can honestly say that this camera is greater than the sum of its parts. It is not about capability since any number of cameras can produce excellent images. But even if you took the word Summilux out of the equation this camera matched or bested every camera listed above ergonomically in my book. I spent near no time staring at the camera wondering how to change setting X or Y. Switch to MF? Press and move the focus tab on the lens away from AF. Change the aperture manually? Move the dial on the lens off of A. Change the shutter speed manually? Move top plate mounted shutter dial off of A. Change the ISO? Press button on the back marked ISO and turn the wheel. Hey, what does this unmarked dial on the top do when you turn it by itself? What do you know it adjusts the exposure compensation. What is this little black button on the back? Crop mode. All this in the first few moments after having picked up the camera without ever picking up a manual or visiting Youtube. Your mileage may vary, but add the Summilux name back in on top of that (and my notes below) and it is a no brainer for me. Leica M acolytes look away until the next paragraph. Nothing to see here… Seems absurd to say, but at the Qs price point there is value to be had here. To achieve the equivalent Leica M specs of this lens and body combination one would need to spend many thousands more for a digital 24MP M 240 body (new or used) or Summilux lens (any focal length used or 28mm new). And I did say ‘or’ not ‘and’. Combine the two and you easily surpass what I paid for my dadmobile daily driver on up into five digits. Some would say that an M advantage is that you can change the lens. Moot point for me. Truth is that if I ever did buy a comparable M lens and body there would be no budget left ever for another lens. And no AF at that price. Tell me of a less expensive AF true Summilux full frame experience anywhere and I am all ears. Not arguing worth. Stating what I am personally willing to pay. And that is the M mount. If you are wondering about the also AF SL line. There is no direct SL wide Summilux prime lens to compare, but whether you get the relative focal length or Summilux you are looking at a much larger set up for many, many more thousands of dollars body and lens combined. And I have seen that the Q and the SL have the same sensor. I.E. outstanding sharpness wide open, class leading sharpness stopped down a little, great focus fall off, great contrast, creamy bokeh, and wonderful colors. Best lens I own hands down is permafused to this camera. Near DSLR speed swift and accurate AF acquisition. Even in low light. How they did this with contrast detect AF only I have no idea. Some Panasonic partner magic perhaps? With useable AF-C tracking in a pinch. That bests all of my other quite capable interchangeable lens cameras. Best of the best mirrorless manual focus implementation. Best of any digital I own 1/16,000s shutter speed available. Not to be used for panning/fast moving objects or it will distort, but fantastic in relatively static brightly lit conditions. 1/2000s leaf shutter available if need be for motion. This the goldilocks MP count for me. Any less is not enough of a post crop detail safety net for my liking. Any more eats into archive RAW storage space quickly and noticeably impacts the speed of my post processing workflow. Some of my favorite work ever was done in MFT. APS-C is just fine for most all purposes. But if available I prefer full frame. Mentioned above, but deserves mentioning again. Looks the part of a 8/10s sized M. Mostly aluminum build only let down by plastic doors for the battery/SD Card opening on the bottom and the cable connections door on the side. Solution? Half case. This Q came with a well built half case that has a battery/SD card door pass through in the bottom and completely covers the other door. Problem solved. Time lapse, panorama and other scene modes. Have not gotten around to using any of this yet. But glad it has them. Mentioning again, because this is not just macro writ large on a non macro lens, but actual fast AF wonderfully implemented real deal macro capabilities. Best EVF I have ever used. And I have used a lot of EVFs. In body 35mm and 50mm field of view crop. May seem silly since you can crop after the fact. Made more useful since the images are so sharp that cropping still leaves plenty of detail. Great for sharing real time with the Leica app. Crop while you shoot instead of after the fact. If you shoot RAW and JPEG like I do it is the best of both worlds since RAW files are not cropped. There are other JPEG settings, but this is the only one that matters to me. but tried it and that camera is too small for my beef mitts. Bought and sold two RX100 cameras for the same reason. For me there is such a thing as too small. A nice size with half case and hood, but remove both and I am able to get this camera into a jacket pocket. Plus more compact than a similar M set up. And far more compact than a similarly spec’d A7III and lens. And it loses nothing feature wise. AF and OIS are all there with added benefits like inbuilt macro and a better control layout. I believe this may be the most compact brighter than f/2 full frame digital camera and body combination on the market currently. Feared short battery life, but one battery usually gets me through a day without issue. Summilux, summilux, and in conclusion summilux. But not so fast. There have to be minuses, right? This was one potential demerit that concerned me. As I have pointed out ad nauseam my usual go-to prime focal length is 50mm or thereabouts. But in use, the 28mm focal length has not proved to be an issue at all. It has forced me to move in to get the shot sometimes, but this is where the small, silent, and quick nature of this camera pays dividends. So far I have thoroughly enjoyed taking shots while in the fray rather than having to back up and away. Has proven handy with environmental candid shots also. And if I do need to step back the bright aperture, ample MPs, accurate focus, and very sharp lens means that cropping is no issue. 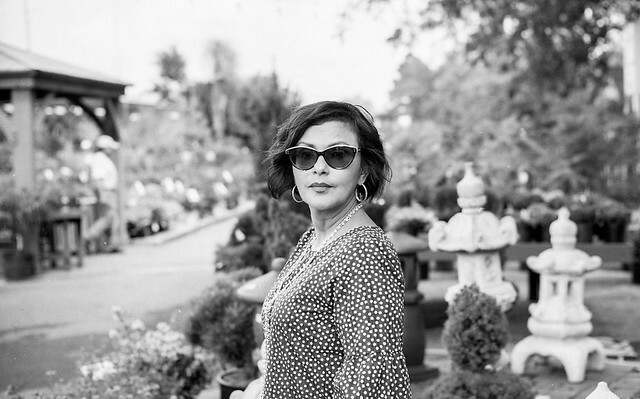 I should not have been surprised since two of my favorite all in one film cameras are 28mm. Would have been nice. But not really an issue for me. Some of my cameras are weatherproofed technically and they all get put away at the first sign of rain regardless. Not really a ding since I am not aware of any other all in one camera that has two slots. But thought I would mention it. Saved the most biased, eye roll/cringe inducing, subjective assessment for last. Fun to use. Fun to review the results. A highly technical and very capable contraption that is simple to use for any situation that does not require a superwide or telephoto lens. I have cameras that have high keeper rates. The Q is the rare camera that has a high “wow factor” rate. And the only one I own film or digital with that “wow factor’ that does not have some usability compromise involved. So much so that I have gone from carrying a gear bag everywhere to just carrying this camera. In fact I have already traded quite a bit of the gear the Q displaces without hesitation to partially fund this acquisition. But lastly “it has been out so long” you might mention. True. But I know of no camera released since that tops this camera. 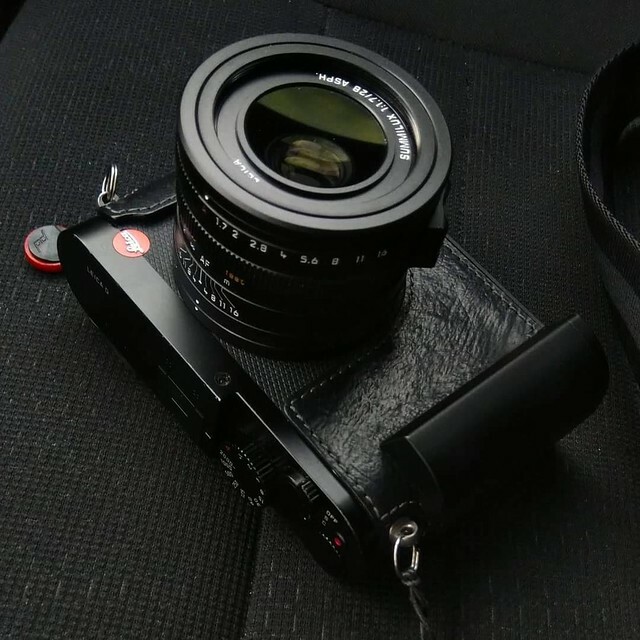 Some mentioned a Leica Q 2 one day, but why? In my humble opinion, there is little that would improve this camera. Have heard rumors that the MP count would be increased for the next one. If true that is not enough to convince me to upgrade alone. Already sold the higher MP A7RII I had because the A7III hit the resolution sweet spot (as mentioned above) for me. So in case you were still wondering I like it. A lot. Here are some sample shots below and here is a link to an ongoing gallery. Traffic jam at the links.